A small CalPERS fund that provides payments to the survivors of workers who die before retirement has a surplus rarely if ever seen in the pension world — 1,736 percent of the funds needed to pay future obligations. But 7,409 local government workers must continue to make $2 monthly contributions to the fund, the minimum required by current state law. Employer contributions have no minimum and dropped to zero. CalPERS has no control over this small fund and six other survivor benefit funds, three also with large surpluses. Legislation is needed to make changes, and lawmakers have rejected CalPERS proposals to increase payments to survivors. “I think the benefit improvement aspect of it is difficult in the current environment,” Alan Milligan, CalPERS chief actuary, told the board. A large surplus in four of the seven funds is regarded as a serious problem. “We have identified there is a potential reputational risk associated with the high funded status and whether or not it’s an appropriate use of member premiums,” Milligan said. In financial terms a “reputational risk” is a threat to the good name or standing of an organization, which can sometimes escalate beyond good governance practices into a fiscal danger. 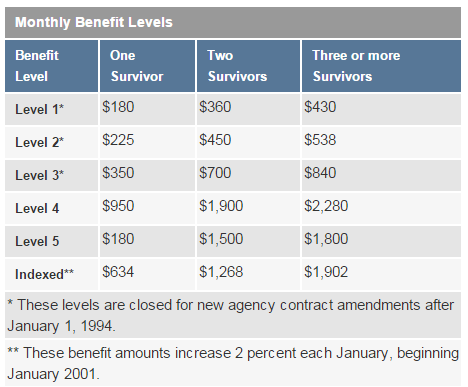 The 1959 Survivor Benefit Program, named after the year it began, is an optional supplement that state and government employers can offer to workers not covered by Social Security, which has a survivor benefit. Last fiscal year the program’s seven funds or pools covered 215,159 active employees. The total market value of program investments was $517.6 million, much larger than the debt or accrued liability for future payments of $327 million. As a result, the total funding ratio for the program was a more-than-healthy 158 percent. But there is a wide variation among the seven pools. The 1,736 percent funding of the Public Agency (local government) 1st Level Pool is an outlier at the high end. 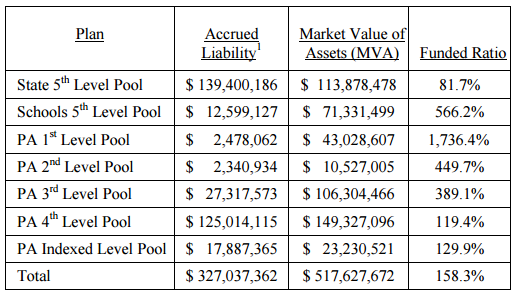 At the low end, with a funding level of 81.7 percent, is the largest pool, which covers 72,848 state workers with $114 million in assets and $139 million in liability. It’s monthly contribution next fiscal year is $5.20 each for employers and employees. For critics of public pensions, the 1959 Survivor Benefit Program is another example, on a much smaller scale, of the faulty design and management of a defined-benefit plan. The California Public Employees Retirement System has a variety of survivor benefits that range, depending on labor contracts and other factors, from a simple return of contributions with interest to lump sums and monthly payments. The supplemental 1959 program for workers not covered by Social Security is intended to give them parity, a survivor benefit roughly matching the one for workers who have Social Security. Social Security survivor benefits are based on individual earnings and have a cost-of-living adjustment increasing with inflation. But the 1959 program is a fixed monthly payment not based on salary that does not increase with inflation. Over the years five “levels” of fixed monthly payments (see chart below) were created in an attempt to keep pace as the Social Security death benefit increased. A sixth “indexed” level that increases payments 2 percent a year was added in 1999. For local governments, the 1959 program option can be bargained during labor contract negotiations. And last year employers with 7,409 active program members had chosen to remain in the original 1959 Level One pool, now 1,736 percent funded. As new higher payment levels were added, Level One was closed in 1994 to new employers — but importantly, not to new employees. So new hires of an employer in the Level One pool continue to get the same low monthly death benefit first offered in 1959. Two other levels were similarly closed to new employers, but not to new members. Level Two (3,939 active members), created in 1975, was closed in 1994. Level Three (41,701 active members), created in 1985, was closed in 2001. Most of the surpluses in the 1959 program, which cannot be used for other purposes, seem likely to increase as members contribute the $2 monthly minimum and the pool investments, which earned 17.4 percent last fiscal year, continue to grow. What happens to the surplus, now about $40 million in Level One, if at some point in the future the last remaining employers, for whatever reason, no longer put new hires in the closed pools? In a brief exchange at the CalPERS board last week, it sounded like the state may have inadvertently created something like a “tontine,” where members contribute equally to a fund that is awarded to the last survivor. “That’s correct,” said Milligan, the chief actuary. A survivor benefit increase was included in CalPERS-sponsored legislation (SB 400 in 1999) that gave state workers a retroactive pension increase and the Highway Patrol a costly pension formula adopted by many local police and firefighters. The legislation moved state workers from Level Three to Level Five in the 1959 program, repealing legislation from the previous year that had only allowed state workers to bargain for Level Five. More recently, CalPERS has unsuccessfully proposed that all the active members in the pools closed to new employers (Levels One, Two and Three) be moved to Level Four, the most generous current level that had 68,814 active members last year. Milligan said the CalPERS proposal that would have increased 1959 survivor benefits was left out of Gov. Brown’s pension reform legislation, preserving the “cohesion” of a package that cut retirement benefits. Board member Jelincic asked last week: “Does it make sense to seek legislation to eliminate the employee contributions” in the overfunded pools? Milligan said that would slow the increase in the surplus, but not by very much. “I’ll take it,” said Jelincic, noting that eliminating the required $2 monthly contribution would save members $24 a year. This entry was posted on April 20, 2015 at 7:26 am and is filed under CalPERS, Operations. You can follow any responses to this entry through the RSS 2.0 feed. You can skip to the end and leave a response. Pinging is currently not allowed.